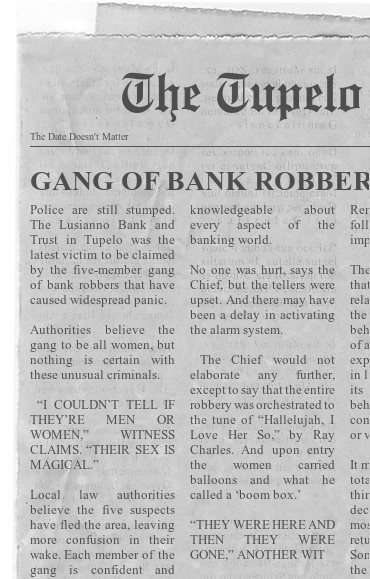 Even so, these mystical women in heels who were robbing and donating continued to make headlines, and banks across the states had never been busier. Men were lining up, never taking such an interest in where their money was stashed, all in hopes of catching a glimpse of them. Posters were made, memes popped up like mushrooms in a wet field online, and a comic strip was dedicated to these women. Pistollette was bigger than life, her legs spread apart, a pistol in each hand, looking down on the world. That exaggerated smile on her face, those brown blinking eyes. Her sisters were right beside her, blowing things up, winking and playing the boom box, tap dancing by a door, flipping on counters. Close to their hairlines, a zipper, and a clear thin line that separated their two sides. The good and the bad. The zipper was the key to their true identity. And below them all were men, amplified cartoon hearts floating from their chests, stars in their eyes, and lust in their smiles. The slogan for these women—not only do they steal your money, they collect interest on your heart. The entire world knew who they were. Headlines read: Maybe coming to a bank near you. Propaganda hung in alleys, on fences, above urinals, and below in underground train stations. They were up in pool halls, in dive bars, and on the walls of the swankiest clubs in New York. They had become art. Modern day sophisticate meets old lawless ruggedness. A huge billboard hung in Hollywood, showing the girls appearing out of smoke: Stealing the hearts of the rich guys, giving to the poor ones. Pistollette and her Sirens will take you by storm! They were for the good guys of the world who cared enough to figure it out. They were elusive and mysterious, and there was a reward for any man who would dare remove any of their masks. The world was sure underneath the masquerades were the most beautiful faces any man had ever seen. No one ever tried. They were too stupefied in their presence. They were truck drivers’ and bikers’ dreams, doctors’ and lawyers’ fantasies. The hoopla went on and on. Gunshots started ringing in Hank’s ears. The holster woman was blowing up the cameras with her pistols. The automatic reaction to cover his ears and close his eyes was tugging at Hank’s natural defense system, but all he could do was watch with wide eyes, ignoring the pain. The motion of the pistol woman’s fingers on the triggers was almost too quick for Hank to see. She was shooting so quickly that it almost seemed like an illusion, an extremely well-crafted magic trick from one of the world’s most famous magicians—in this case, the pistol woman. It couldn’t be a trick. The cameras were exploding and Hank’s ears were ringing something fierce. She was holding those pistols just as naturally, and as confidently, as some women hold newborn babes. You never try to take a crying baby away from a woman. Never, Hank thought. Her writing career began one sleepless night when she imagined a gorgeous woman and a man with maniacal hair floating above her like lightening bugs falling from the sky. Curious about them, their story, and why they were floating around in her head, she sat down and penned (typed) her first novel, Marigny Street. A dream come true for her, she hasn’t stopped writing since. She loves a damn good love story, always has, no matter what the genre. She is particularly moved by imperfect love that in its own unique way is perfect, the notion of love at first sight, soul mates, and things that are generally out of the norm.